Over 25 old and new Angel Runners alike took to the streets of London this Sunday 8th July, to run the London 10k Run for Global Angels. Along with over 25,000 other runners, the team ran over 6 miles past iconic landmarks such as Big Ben and the London Eye, to raise funds for Global Angels projects worldwide. After our first ever 10k run in July 2011, Angels from last years team along with some brand members have been training hard and raising sponsorship for their chosen projects. Our Angel runners have raised £3,729.50 so far for causes including Trafficked Kids and Child Slaves, Water For Life and Feed A Child. This includes £621 for victims of trafficking and a huge £1771 for water – This means that 354 people will now be provided with safe drinking water for 10 more years! 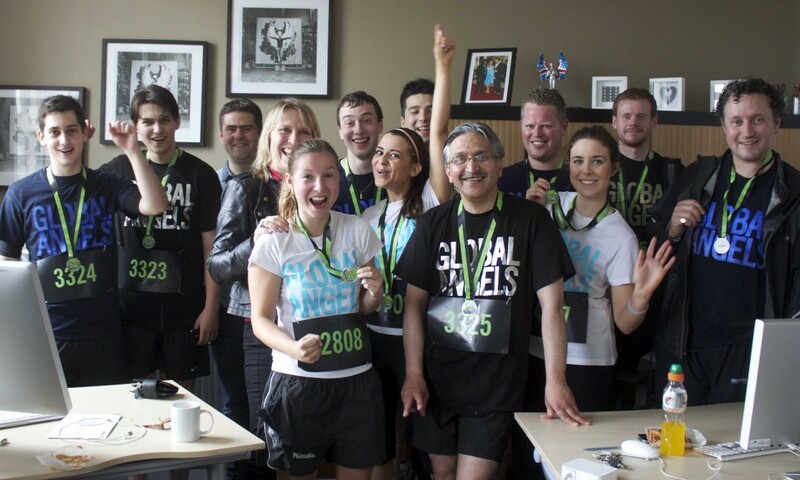 This year, Angel Ambassadors I Am Tich and Raphaella completed their second 10k run for Global Angels, joined by new Ambassador, radio and television presenter Caroline Feraday. They ran alongside Global Angels supporters, staff & Advisory Board members and Corporate Angels RGB Digital and Currency Solutions. Our youngest runner, Bailey Sprague, was just 11 years old and completed the race in 51 minutes! The title of fastest Angel Runner goes to Jason of RGB Digital, who raced over the finish line in just 40 minutes, wow! The atmosphere on the day was amazing, despite the rain, and everyone completed the race in high spirits and some managed to meet up at our office for well deserved pastries and coffee. A few members of the team also joined us in the evening to watch Raphaella perform at the Global Love Festival, a great way to round off the day and celebrate everyone’s achievements. As our second Angel Running event, our team of Angel Runners is growing and we are looking forward to planning more events in the coming months. Please let us know if you would like to get involved with our Angel Runners as we are always on the lookout for new runs to take part in!